The activities of my ancestors outside of their usual occupation is always of interest to me. Their sports, pastimes, hobbies and social activities often help define them as people and sometimes those activities are present in later generations. Also, it can lead to further information from club records and results in newspapers. In some cases, much spare time was devoted to the church, maybe on the committee such as William Hadden or as a lay preacher like James Harman. James was also able to find time for his other passion, ploughing competitions, not mention various committees, such as the local school. Richard Diwell had an interest in the Hamilton Horticulture Society, but also indulged in photography. The photo in the post Elizabeth Ann Jelly was one of Richard’s using a camera with a timer, a new development in photography at the turn of the century. My grandfather, Bill Gamble, grandson of Richard Diwell, had many interests particularly before he married. He played cornet with the Hamilton Brass band and was a committee member of the Hamilton Rifle Club and a state representative shooter. He also loved fishing, motorcycles and like his grandfather before him, photography. As a result we now have hundreds of photographs of motorbikes and fishing trips. He even developed his own photographs. His passions of photography and motorcycles were passed on to his son Peter. Many of the Holmes and Diwell families were members of Brass Bands at Casterton and Hamilton. Alfred Winslow Harman was a rifle shooter and I recently told you about Nina Harman, wiling away the hours completing tapestry carpets. I recently found an activity which previously hadn’t been present in my family, greyhound breeding. James Stevenson was the grandson of James Mortimer and Rosanna Buckland. He worked as a manager at “Hyde Park” a squatting run north of Cavendish until it was split up in 1926 for the Soldier Settlement scheme. After this James moved to “Glen Alvie” at Cavendish where he described himself as a grazier. In 1927, he advertised five well-bred greyhound pups for sale. At £4 each, he stood to earn £20 if he successfully sold them. A seemingly profitable hobby indeed. James would have needed a good return on his pups as the sire’s stud fees would have been pricey given Cinder was imported by successful breeder, Mr Dickie of Bacchus Marsh. 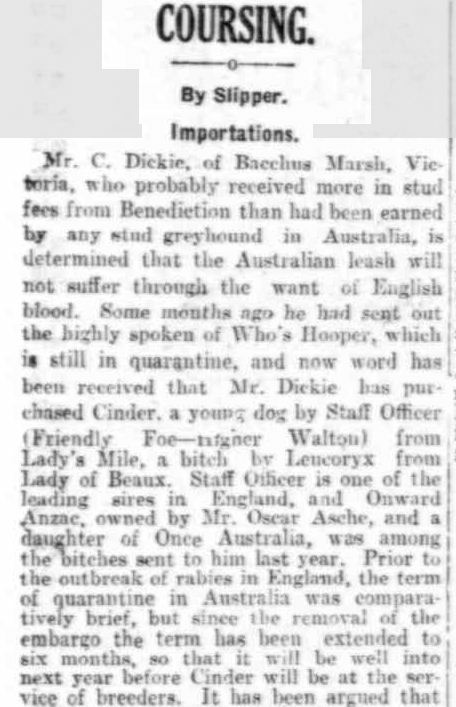 The article from the time of Cinder’s arrival in Australia in 1923, reports the dog remained in quarantine for six months. Because of a rabies outbreak in England, there was an extension to the time spent in quarantine only a short time before his arrival. In 1927, the time of James’ advertisement, greyhound racing using a “mechanical hare” began for the first time at the Epping course in New South Wales. It took longer for other states to adopt the “tin hare” where they continued with the traditional field coursing. WHAT DID YOUR ANCESTORS DO IN THEIR SPARE TIME? This entry was posted in Miscellaneous and tagged Diwell, Gamble, Hadden, Harman, Holmes, Mortimer, Stevenson. Bookmark the permalink.